The end of summer is truly the best time for the Farmers’ Market, both due to the tremendous selection and the incredible colors of the peppers, tomatoes and zucchini that populate so many tables and produce baskets. 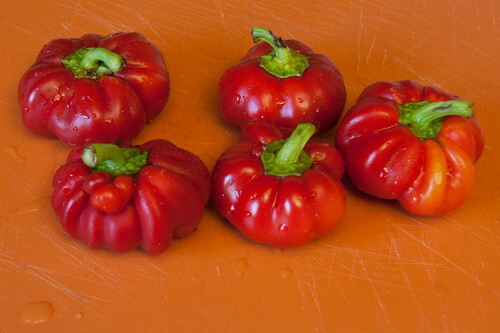 Among the notable specimens a few weeks ago were the red ruffled pimientos from Lloyds’ Produce. These pimientos are bright red, about the size of a nectarine and a little squat. I grabbed five of them in a trip that also yielded three pounds of bacon, some heirloom tomatoes and I can’t recall what else. I picked up so much produce that I actually forgot about the pimientos until a few weeks later, when I uncovered them in our quite full produce drawer. Fortunately, they were still intact—firm and bright red. One thing I could say for these guys before I even tasted them was that they were hardy. I recently made a big batch of meatballs and saved a lot of the meat for later use. The pimientos were about the right size to accommodate a meatball inside, so I decided to stuff them with some of the meatball mixture. I began by cutting the caps off and removing the seeds. I spooned the meatball mixture into each pimiento, filling them to the brim. My meatball recipe is one of my only cooking secrets, but I think any dense ground meat mixture would work, as would Italian sausage. 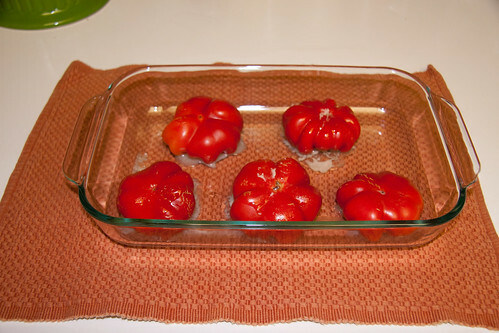 Once stuffed, I put them in the oven to bake at 350ÂºF. After 30 minutes, I pulled them out and flipped them meat side down. Then returned them to the oven. 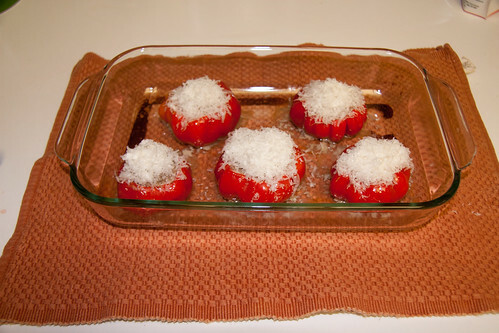 After another 15 minutes, I flipped them back over and covered the tops with shredded parmigiano reggiano, then returned them to the oven for another 10 minutes or so, using the broiler for the last three minutes. 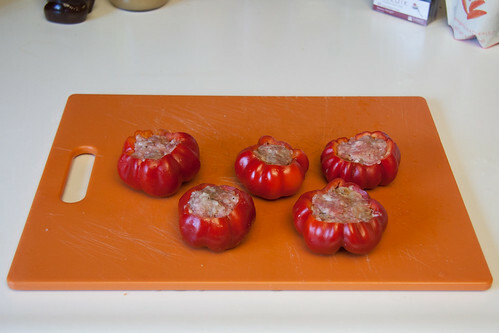 The pimentos came out soft and lightly charred around the edges with the cheese and meat browned on top. 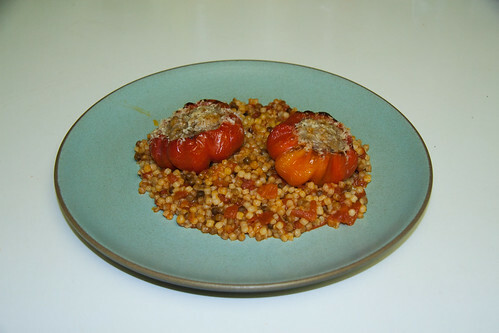 We served them atop toasted fregola with tomatoes and garlic. 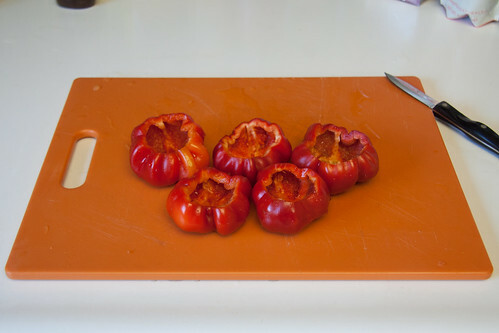 The red ruffled pimientos were a little spicier and less sweet than a red pepper, but not hot. The meatball complemented them well, and together with the tomatoes in the fregola created something like a deconstructed arribbiata.